There are many obligatory tasks to do in the vineyard at this time of the year as the vines are rapidly growing and setting berries just before bloom. Such as keeping up with the spray regime for fungal control and monitoring and adjusting the growth of the vines to optimize the grape ripening later in the year. As I have said before, good vineyard management includes spending time looking into and thinking about the future. One of those future thinking endeavors is planning the ripening of the grapes by making sure the grape vines leaves each get enough sun to contribute to ripening the grapes; an especially important task in our cooler climate. Our vines are trained using the double Guyot method which means the canes are bound to the lowest wire on our trellises in the spring and the new growing canes grow upwards into a series of horizontal wires which support their vertical growth. 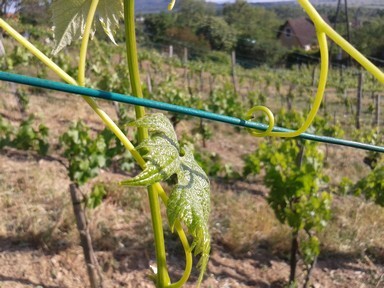 Since wine is a vine, it will curl itself around the trellis wires naturally, and this is of course encouraged. 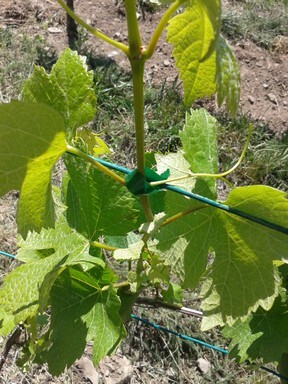 Wine vine attaching itself to the trellis wire for self support. But being a vine it will go into all sorts of directions along the trellis wire if allowed to do so on its own. So for optimal grape growth and ripening a bit of intervention is at times needed to make sure the canes are placed in the best place for optimal sun exposure and bound there. The more direct light each leaf receives, the more sugar it can put into the ripening grapes later in the year. Thus at different times of the season the vineyards are visited and the wine is bound to the wires at each level in an optimal position if and when needed. Traditionally, binding is done with string. In fact many of the vineyards here, both large and small use this method. Using hemp or another organic string is also very ecological as the string will eventually naturally decay. 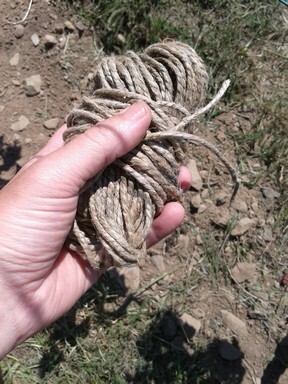 A traditional tool to bind wine: string. Binding with string can be very time consuming and requires a bit of finger skill. I like tools and gadgets. Especially tools that are simple and make my work easier. One such useful tool is an automatic hand operated binder. Step 1. Start by compressing the tool gently to grab the binding tape. Step 2. Release to unreel the binding tap. Step 3. 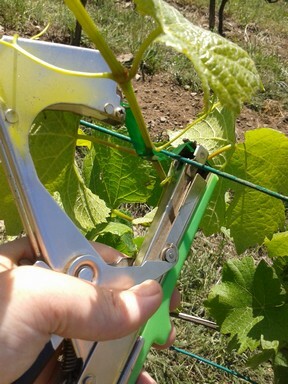 Position the tool around a cordon wire and a vine stem to bind. Step 4. Compress the tool again, this time hard and the tool will staple and cut the binding tape at the same time. Step 5. 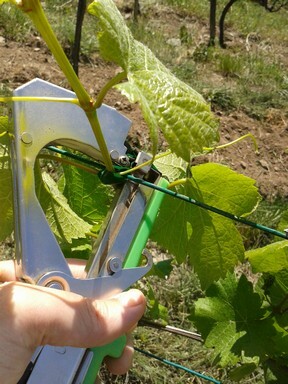 Remove the tool and you will see the nicely bound vine. Not as ecological as string, since it uses plastic tape and metal staples. But it sure is much, much faster than binding with string. The automatic binding tool also works well for binding tomatoes.